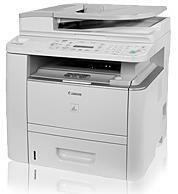 Print, Copy, Scan and Network with the Canon imageCLASS D1120 Black & White Laser Multifunction Copier. In today's office environment, keeping your costs low is essential for a successful business. The 50-sheet Duplex Automatic Document Feeder (DADF) allows you to copy or color scan from one or two-sided originals and produce two-sided output with ease, cutting your paper usage as much as half. The intelligent Energy Saver Mode reduces your power consumption to approximately three watts of power and the product meets Energy Star guidelines, helping you save money on energy costs.